Selkie’s mom has a role in this. So Elder Scrolls Online early access began last weekend, and I am DEVOURING this game you all. Meet my Argonian Templar, Smells-Like-Teen-Spirit. Someone needs to get a fish-flavored sugar-free ice cream cone after all this. I laughed so hard about the making of the mother to do lines! Weave a cone/basket from BACON! …maybe steak-flavored ice cream would be better. Dave, I truly admire your work. Your characters are believable, with strengths and weaknesses, with depth and balance. Thank you so much for sharing. Good luck Selkie! Forgiving people is hard work sometimes, especially when you don’t understand. It is possible for Selki to have a fish flavored ice cream. The Inuit make something called Akutuq which is made of various fats – caribou,whale, seal etc. mixed with snow and berries. they also sometimes add ground fish to it. Skip the berries and she’s good to go. Sugar. Comes from sugar cane – plant. Sugar beets – plant. Corn – plant. Maple tree – plant. Sugar free does not necessarily mean “artificial sweeteners”. Black coffee is sugar free. It has no sweetener. With everything that we know of that’s sweet (that did not come from a laboratory) came from a plant, quite possibly a total carnivore has no appreciation for “sweet”. Probably her tongue can’t even taste it. I agree that she may not be able to taste sweets, but I don’t think she would have any negative reaction either. Processed sugar contains very little actual plant matter. I think it wouldn’t matter to her if it was sugar-free, sugary (is that even a word? ), or not sweetened at all. Completely unrelated to the (admittedly awesome) comic – your Argonian looks so cool! Maybe I should get into the Elder Scrolls Online. But I don’t like playing video games with other people – they get in the way of my enjoyment. Anti-social, moi? Anyway, back to the comic. I love the way that this story is progressing. I find it so very difficult to wait until each update comes out, and I am constantly spamming my brothers with links to Selkie because each page brings out an emotional reaction from me, whether it’s a laugh or a tear. Keep up the incredible work, Dave! She’s talking like her mother dumped her in the orphanage—but she doesn’t *know* that’s happened. A variety of events and scenarios could have led to how things wound up…some of which could’ve involved her mother being unable to stop it. At the very least, we know there was a whole frickin’ CIVIL WAR going on at the time and that Selkie’s clan was mostly wiped out. Selkie’s Mom was probably a refugee and certainly in exile from what the Pohls have explained. 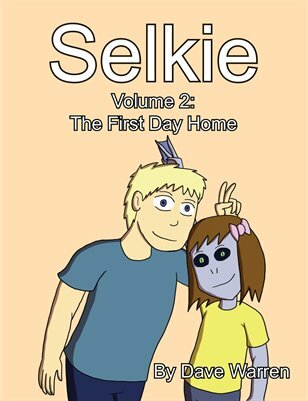 We just don’t know for sure why Selkie’s Mom thought she would be better off living as a human than staying with her. She doesn’t know about the civil war yet. Her reaction in panels 6 and 7 is based entirely on needing to believe that her mother loved her. There HAD to have been a very good reason, even though she doesn’t know what it is. She’s going to give her mother the benefit of the doubt on that score — but… not giving Lilian her name? Nope, she can’t imagine any excuse. It would have been such a simple thing to do. So she figures when she does meet her mother again, she’s got a perfect right to yell at her for THAT, at least! A very healthy response, it seems to me. But from her perspective, that’s probably exactly what happened. I meant that she (and, for that matter, we) don’t know that her mother had *anything* to do with her being put in the orphanage. By definition, an “orphan” is a person whose parents are dead. Do we know Selkie’s parents are dead? Can we assume it? I play ESO too! What faction do you belong to? Seems like an Aldmeri Dominion background to me… Are the backgrounds even faction-specific? Yep, currently Aldmeri Dominion. Considering re-rolling as one of the others though, while I am still low-level. Although ones probably as good as another. I’m envisioning a snowcone where the “ice” is made of fish or shrimp broth and the “cone” is formed out of fish jerky. I suppose you could make a fish infused icecream since Selkie can eat dairy but I think she’d enjoy a frozen lobster bisque or similar put through a sno-cone treatment. Tuna flavored icecream actually does exist somewhere in the world; I saw it in a documentary. …I couldn’t say where, though, because that’s the only detail I remember from the documentary. You’re welcome. I hope to see you in Tamriel. Awe, the memory of her mother’s sad eyes in the background of panel 5 is really in my feels… but her recovery is excellent! Dunno about fish ice cream, but how about bacon? Thinking of sugar and plant material…. Of course, the science in Selkie is a bit odd. The artist is an artist, not a biologist. First off and most importantly great strip as always. Second when did you start putting a disclaimer for the comments up under the comic? This is the first I’ve noticed it. Couple days ago, but been meaning to do so forever. Thinking back, when I was around Selkie’s age, probably even a bit younger (it was around 2nd/3rd grade), I actually had a choice to change my name as well. It was my last name, rather than my first. I could either keep my mom’s maiden name, or change it to my step-dad’s last name. I changed it to my step-dad’s, but in the end no one outside the family could pronounce either names anyway just by reading it. I love love love Selkie being mad about this. COMPLETELY JUSTIFIED. And I love that she doesnt take it as a sign of her mom not loving her or whatever, it’s just a sucky thing that happened and that she’s now mad about. Not something her mom meant to happen. Full stop. I love it when kids know they can blame adults for mistakes, like they themselves can be blamed. That “not on purpose” is a thing that happens to everyone, and doesn’t absolve from culpability completely.